What supernatural blessing did God give Abraham? IS THE BIBLE A Protestant Book? 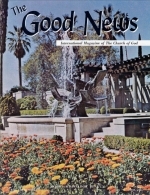 [Please read Personal by Herbert W Armstrong about this article - May 1964] Did God entrust the Protestant reformers with the New Testament text? Did He now allow Protestant scholars to discover the original unadulterated words of the Apostles? Are PROTESTANTS the guardians of the New Testament? PROTESTANTS CLAIM that: "The guardianship of the Greek New Testament passed from the Greek Church to those who were MORE FAITHFUL to its teachings, namely, to evangelical Protestants.